Charitable giving during the holiday season is a recognized tradition all over the world. From donating to your favorite charity to volunteering at a soup kitchen, charitable giving is every bit as important to the holiday season as spending time with friends and family. From a financial planning standpoint, charitable giving should be on your mind at the close of the year. Twenty-six percent of taxpayers itemize charitable deductions on their tax returns, and with careful planning, you can make charitable giving an important part of your estate planning. You can also use your finances to expand charitable giving beyond the holiday season and make it a year-round commitment. Choosing charities you believe in or groups that share your philanthropic goals can help you make the most out of your donations. Cash donations. Usually, this type of giving is fully deductible for the exact amount you gifted. If you donate more than $250, you’ll need a receipt. If you gift the charity in cash rather than a check or credit card, you’ll need to request some kind of bank statement or receipt from the recipient, no matter the amount. Tangible assets. When gifting things that correlate to the charity, such as old clothes to the Salvation Army or art to a museum, you can usually deduct the full amount of the items based on their current worth. If the assets have nothing to do with the organization’s aim or mission, you are allowed to deduct the amount you paid for it or the item’s reasonable value, whichever is the lesser of the two. Appreciated long-term assets. In most cases, you can deduct the full fair market value of long-term securities that you have held for more than one year. However, the deduction is limited to 30 percent of your adjusted gross income (AGI) compared to the 50 percent limit for donating cash to charities. Donating your stocks directly to a charity can offer more tax benefits and can lower your income tax bracket. Volunteering. Although you cannot deduct the time you spend volunteering, you can deduct the transportation costs and other expenses related to your charitable work. Donations of $250 or more. Anytime you donate and want to claim a deduction for donated cash or goods of $250 or more, you must have a written statement from the charity. The statement should display the amount of the donation, describe any property given, and indicate whether the organization provided any goods or services in exchange for the gift. Donated property. If you donated property instead of cash, the deduction amount is typically the fair market value for the items. Benefit in return. 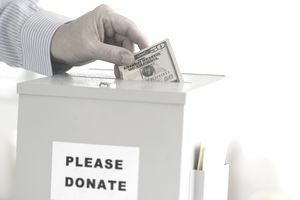 In cases where you get something in return for your donation, your deduction will be limited. You will be able to deduct the difference between the amount of your gift versus what you received in return. Qualified charities. The IRS has guidelines on qualified charities. For example, if you want to deduct your charitable contribution, you must donate to a qualified charity. Additionally, you cannot deduct gifts to political organization or candidates. Records to keep. Accurate record keeping is important. As you make contributions throughout the year, you must keep records to prove the types of donations are you making. Regardless of the amount you donate, you will need a record if you choose to make any deductions. Regardless of how you want to give your time and money to charities, it is always a good idea to sit down with a qualified financial planner. A financial planner can offer advice on the types of donations that would work best for you, your estate, and your future plans, as well as help you find an organization that shares the same philanthropic goals and ideals as you. Another resource that may be helpful when it comes to your charitable giving plans is Charity Navigator. This website will give you tons of options when looking for a charitable organization and makes it easy to find an organization that is not only legit but caters to the causes you want to support.